What if I told you there were ways that your skin could look even more fresh-faced…and it had nothing to do with finding the perfect concealer?! WOULD YOU EVEN BELIEVE ME?! Of course you would….because you know that I am truly committed to my skin, and nothing screams “perfect skin” quite like well-rested skin! 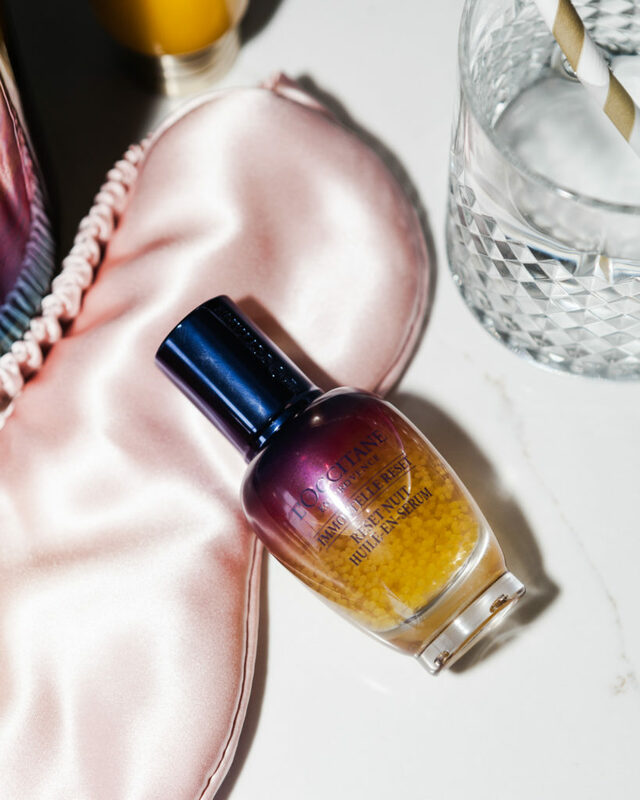 As a skincare junkie, a big part of my regimen is REST, but unfortunately, most of us ladies don’t have the luxury to sleep 12 hours a night and wake up looking like a fresh-faced Sleeping Beauty! Yes, I have been known to forego a night out on the town for a one-on-one date with my beauty rest, but during those busy work weeks (and sometimes, even busier weekends! ), I have had to discover some beauty & lifestyle hacks that help me appear more BRIGHT EYED & BUSHY TAILED! 1. CHUG WATER ALL DAY, EVERYDAY. If I’ve said it once, I’ve said it a million times: What you put into your mouth is EXACTLY what comes out on your skin. My goal every single day is to drink 8oz of water for every hour I am awake. So let’s do the math…If I sleep 8 hours, then I am awake 16 hours of the day. That’s 8oz X 16 hours = 128 ounces. And yes, it can be difficult somedays, which is why I keep a carafe of water on my nightstand and refuse to give myself coffee in the morning until its finished! Hey, whatever works, right?! Also, your skin will never get upset at you eating a diet that is 80% colorful fruits & veggies! 2. INVEST IN GOOD SKINCARE. I don’t mean to appear like a broken record on this topic, but if you aren’t treating your face to a skincare regimen twice a day, then you can’t complain about what’s staring back at you in the mirror! Everyday, your skin is exposed to what’s in the environment (not mention your makeup, too! ), and these aggressors cause your skin to appear dull, dry, & lackluster…which is why L’Occitane has come to the rescue! 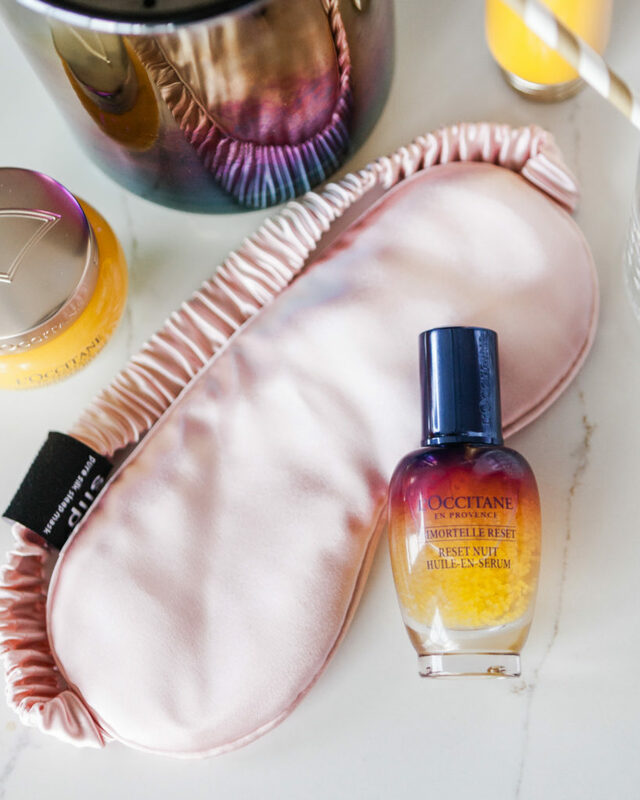 Last year, I introduced L’Occitane’s Immortelle Divine Collection to y’all in THIS POST, and this year, they have added a new product to this transversal collection…Immortelle Overnight Reset Serum! This oil-in-serum (YOU KNOW I LOVE AN OIL!) is used at night (after cleansing, before moisturizing) and delivers you skin that looks rested in JUST ONE NIGHT. 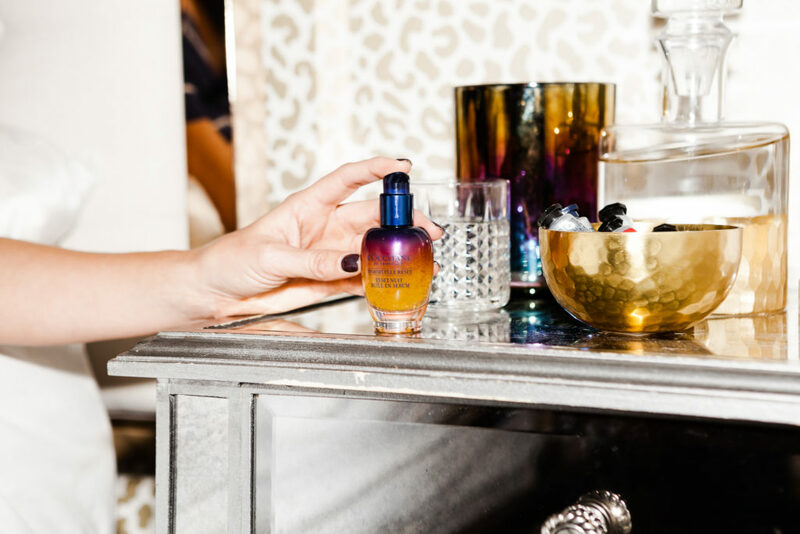 But the benefits of the Reset Serum extend far past one night: after 7 nights, your skin will appear revitalized, & after 28 nights, you look transformed….and if you ask me, that’s WAY better than 8 hours of sleep?! 3. SWEAT FOR 30 MINUTES A DAY. For the longest time, I worked out 4x a week and was fine with it. And yes, I still workout 4x HARD each week (circuit training, spinning, etc), but for about the last 6 months, I have been committed to still finding 30 minutes those other 3 days of the week to sweat….somehow, anyhow!. Maybe it means I take Fancy on an extra long, brisk walk. Or somedays, I call a girlfriend, & instead of catching up over cocktails, we try a new workout class. I’ve even been known to turn on my favorite music & have my very own dance party in my apartment! By sweating everyday, you burn off that extra energy (& sweat the gross stuff out of your skin! ), and as a result, you end up falling asleep quicker & getting into a sound sleep. 4. PUT DOWN THE BOTTLE. I’m sorry to “kill your buzz” (pun intended! ), but alcohol is making your skin look sallow & tired. about 18 months ago, I wrote a blog post about 10 always that quitting drinking changed my life (READ IT HERE! ), and one big piece of it had to do with the way it made my skin look. As a result, my skin appeared brighter & more hydrated….and what would you know….those bags under my eyed practically disappeared! I know its difficult to turn down cocktails as we move into the holiday season, but just try having one glass of water for every alcoholic beverage you consume…your skin will thank you the next morning for it. 5. TURN OFF YOUR TECHNOLOGY…OR AT LEAST PUT IT IN SLEEP MODE. I know this sounds dramatic considering we live in such a technology-fueled society, but our phones might actually be contributing to why we feel (& LOOK!) so drained. Personally, I know that my iPhone is the last thing I look at before I go to sleep (don’t tell Fancy!) & the first thing I look at when I wake up, so there’s no need for it to be distracting me during my sleep cycle, too! Recently, I moved my cell phone into the other room while I sleep, and yes, this was quite the adjustment, but I think it’s definitely aided in not waking up throughout the night! What are ways that you ensure to look more rested (even if you aren’t!) that don’t include makeup?! Let me know in the comments below! Scroll through to shop the L’Occitane products I mentioned above, PLUS some of my other favorites! *Thank you to L’Occitane for partnering on this post & creating products that keep our skin healthy, glowing, & always looking well-rested! I will have to check this out because you are absolutely glowing! I’m not always great about getting sleep and working out. Being over 30 is sooo much harder…I feel like a used car with parts breaking down if I skip on selfcare even for a day! Loving these tips, and that serum looks so good!